TH was in Sydney, I have no idea where in the world RC is these days and I was having a very slow day at work. So I took on this baby mostly during working hours and found myself mostly at Degani’s in Burnley (sans Elvis impersonator, sadly) praising the good DA’s name; I think this is his best since this blog has been started. 13 across: Islander virulent against US intervention? With a t as the first letter and a tentative s as the third, I figured Tasmanian was the answer even though the only explanation I had for it was that Tasmanian = islander. The other clues referring to 13-across all seemed to confirm my suspicion, but I still had no watertight explanation. Only with the solving of 24-across, which put an inopportune e in the middle of Tasmanian, did I realise the answer was going to be Taswegian and the explanation virulent against = tasgian, us = we, virulent against US intervention = Taswegian = islander. With that, only a few clues remained of the crossword by knock-off time. 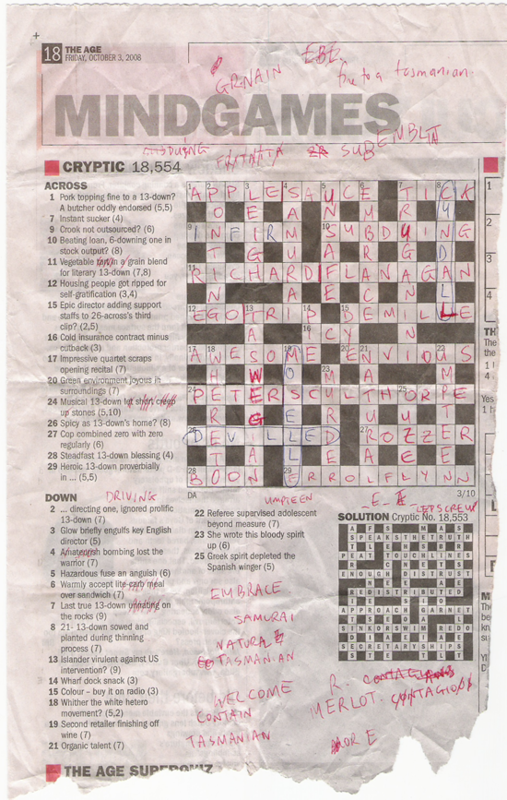 Between then and the witching hour, though, progress was only made on one of the few unsolved clues, and I consulted the SMH online for the answers to the rest (for some reason, the crossword software never works in my browser on The Age website). Now Tasmania is happily associated with one of DA’s best. Excepting Launceston, my already high estimation of the place shot through the roof, and I’m expecting cryptic-crossword aficionados to mysteriously drift southward as if this DA were a siren’s call from the other side of Bass Strait. The only one I had to run up the white flag on was 9 across. Not too difficult in hindsight either. I had the phrase “in-house” in mind, but “in firm” never occurred to me. D’oh! By the way, thanks for the link to the Language Hat blog, it’s great. I can lose myself for hours trawling the fascinating archive of posts there. On September 8th 2008 there was a post “Kittitian” about words used for people from various regions (Kittitian is the word for someone from St. Kitts). A commenter mentioned Norwegian/Glaswegian (for people from Norway/Glasgow) but not not Taswegian. I have lived all my life in Melbourne, but I have never been to Tassie. That’s a ridiculous situation I must rectify soon. The erudition on display at LanguageHat, both from the blog owner and the commenters, is astounding. This was a bit of a killer. I’ve just got to exactly the point you did with 24-across (with the aid of Wikipedia, as I’d never heard of Peter Sculthorpe), and figuring that I needed Taswegian instead of Tasmanian. I got about 3/4 of it out, but the ones I had left I wouldnae have got in a month of Fridays.